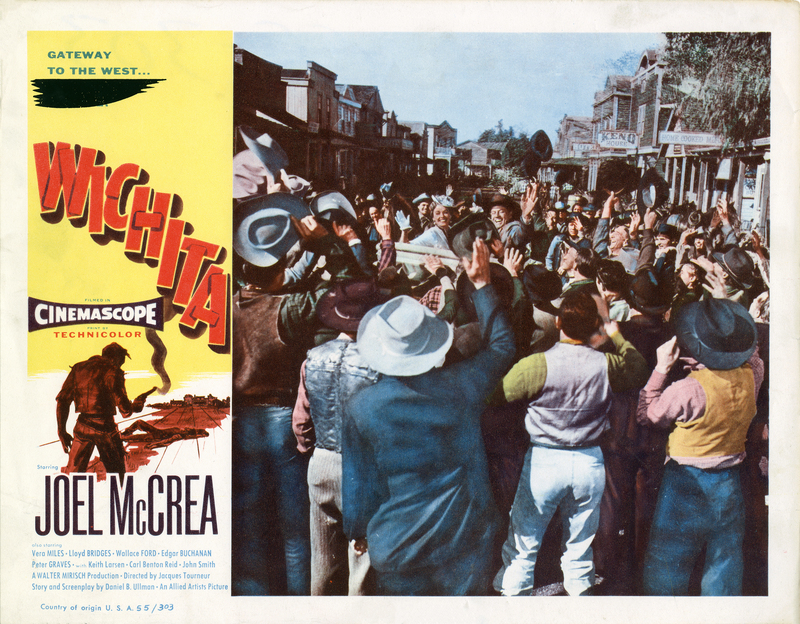 SCVHistory.com LW3395 | Melody Ranch (Main Street) | Joel McCrea Stars in 'Wichita' (Allied Artists 1955). Main Street Scene in "Wichita"
Lobby card, 11x14 inches, shows the main Western street at Gene Autry's Melody Ranch in Placerita Canyon as it appeared in 1955's "Wichita" starring Joel McCrea and Vera Miles, who are seen in the middle of the image. The image is a colorized version of this publicity photograph. We don't know what has been blotted out under the words, "Gateway to the West," at upper left, but the same thing seems to occur on all U.S. lobby cards from this picture. The number at lower left, 55/303, means it was the 303rd picture to receive a number in 1955 from National Screen Service, the company that licensed most studios' promotional materials (including lobby cards) to distributors. The film premiered July 13, 1955, in Wichita, Kansas. LW3395: 9600 dpi jpeg from original lobby card purchased 2018 by Leon Worden.